A self-reflection on the necessity of college campus tours, why you should go on them, and my inability to understand this for five years. Before entering college, I made a huge mistake that I can't take back. The result of my mistake was something long-lasting and irreversible. As dire as that sounds, no, I didn't cut someone out of my life or lose an irreplaceable family heirloom in the unending depths of the ocean; the mistake I made was something much less severe, but still as impactful: I never went on college campus tours while I had the chance. I never thought it was important or necessary to go on campus tours for a multitude of reasons: I didn't need to judge a college's looks vs. the quality of education I could receive, online brochures have pictures, many colleges have virtual campus tours, I wouldn't care about amenities or hang out spots because I was going to be commuting anyway... I could go on. But when I think back to the real reason I didn't go on any campus tours, I know it was deeper than all of that, no matter how convincing my arguments were. The real reason I didn't (want to) go on any campus tours was simple: I was afraid I'd fall in love with a college I wouldn't get accepted to. As an emotional soul who craves commitment, as is true in my personal relationships, I used that same concept in searching for and applying to colleges. I had the irrational fear that seeing a campus in person, walking through it, being told its history, and becoming acquainted with it would risk me falling head over heels for all it had to offer. See, when I fall, I fall hard - and fast - but never fleetingly, so I didn't want to be madly in love with a school that I'd never be allowed to go to. Call it: "Fear of Unrequited Love - College Edition". To avoid being heartbroken by any of the colleges I really wanted to go to, I decided that the best thing for me to do was apply to 12 of them to spread my reach as far and wide as possible so that someone would HAVE to accept me. My choosing process was based mostly on cost and location; I applied mostly to in-state schools as the tuition was cheaper and I'd be closer to my family. Of the in-state schools I was applying to, I wasn't accepted to my first choice school, DePaul University. But seeing as I was accepted to my second, third, and fourth, I didn't fare too poorly. For some reason, I had adored DePaul for years without ever having visited the campus, which painted my view of the school as my academic be all/end all. This phenomena of falling in love with some(place)(one)(thing) before even seeing it (them) in real life is where the heart of this article lies. I fell in love with DePaul when I was 17 years old - before ever stepping foot on campus, before ever walking around and getting a feel for the atmosphere, before knowing the ins and outs of the student center and the beautifully constructed modern architecture. And until I was 22 and a first-year grad student, I hadn't stepped on the campus until after I had already submitted my acceptance and began attending the university. As a new and proud Blue Demon, saying I love the school (and campus) might sound a bit biased, but it's true. I lucked out in choosing where I attended for both undergrad (UIC) and grad school (DePaul) in the sense that I was able to easily adhere to life at both campuses without having visited them prior to accepting their acceptance. And after having become acquainted with DePaul over the course of the past six weeks, I feel like I'm adapting to the environment even more. However, with my job - (I work for a nationally known tutoring company), we've been visiting local universities during back-to-school season, and because of these mini excursions, I've been afforded the luxury of visiting and becoming acquainted with two new college campuses I'd otherwise never have seen. In total, I visited four universities with work, two at which I've been a student. In order, I visited: the University of Illinois at Chicago (UIC), Loyola University Chicago, DePaul University, and the University of Chicago (UofC). A lot of thoughts passed through my mind and a whirlwind of emotions engulfed my body during the campus visits - particularly when I came back to visit UIC. Upon returning to UIC, I felt completely enveloped in comfort. Everything was familiar, the sounds, the smells - even the people. Maybe it was the concrete architecture surrounding the quad or the familiar trees' leaves rustling in the wind as I looked out from the Pier Room while drinking a latte from Dunkin Donuts. 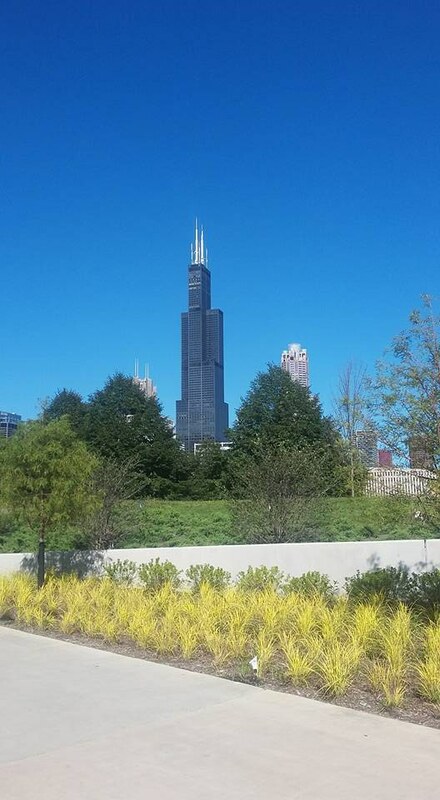 Or maybe it was the beauty of the Sears (yes, Sears) Tower that I got accustomed to seeing everyday. Honestly, I don't have an unbiased opinion about the campus because I spent some of my best moments there. I'm still fond of UIC, flaws and all. When I made my way to Loyola for the first time, however, I felt different. Loyola has always been a rival school to UIC, so naturally, I hated the school and campus in for no logical reason. I knew nothing about the university, so when I stepped onto the ground of "enemy" territory, how I felt was beyond surprising. I walked around campus at 7am by myself, completely engrossed in solitude and deep thought. 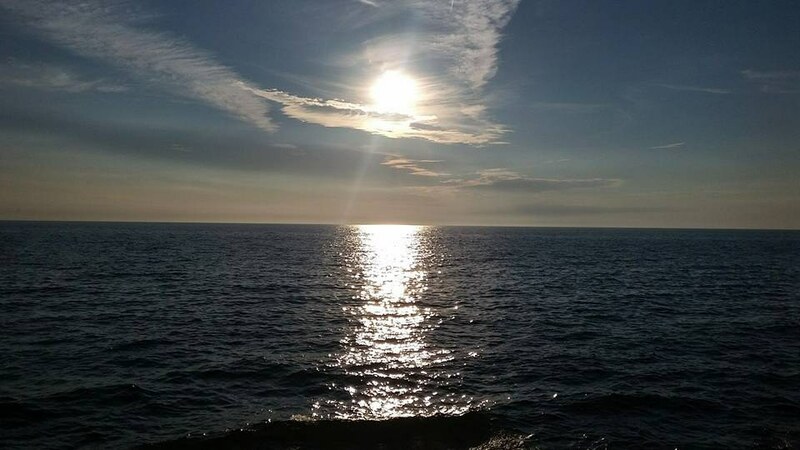 The wind was light and blew onto me off of glistening Lake Michigan just steps in front of me. I felt overwhelmed by serenity. For the first time in a long time, I was completely at peace. I have never felt that sense of stability or comfort from a new place so immediately. I couldn't and still can't explain what visiting Loyola did to me, but I will say it's back on my radar for my PhD program once I graduate with my MA. The next place I visited for the first time was, ironically, the place I'd be attending grad school, DePaul. I had never been on the Lincoln Park Campus prior to graduate student orientation, so I brought a friend and decided to walk around and try to become familiar with my new "home". Though the university is large - 26,000+ students strong - I got the feeling that I was walking through a small liberal arts college. I liked the immediate sense of closeness and community I felt while walking through buildings whose names I had yet to learn. The school's ambiance gripped me in a way the other two hadn't, but I felt comfortable and like I was able to be absorbed into the environment around me like I had always belonged. 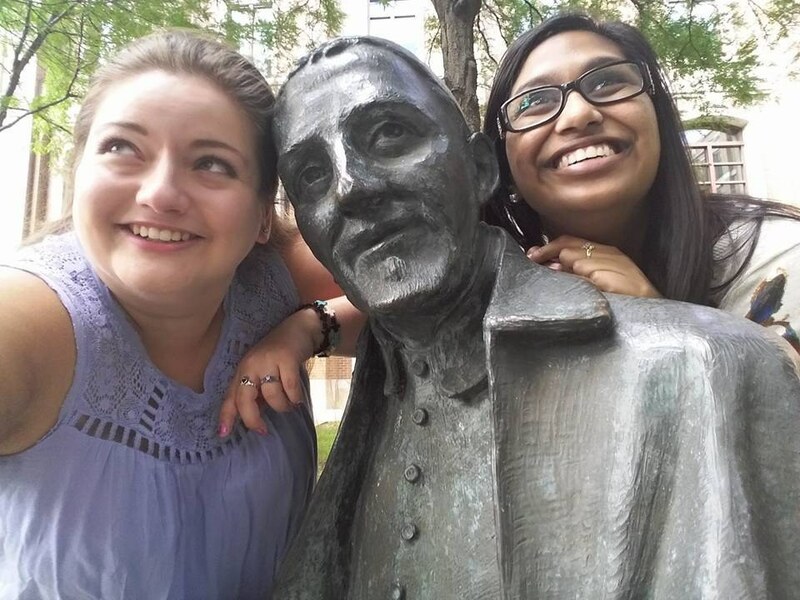 Instead of taking pictures of the beautifully constructed buildings, though, my friend and I spent our time becoming acquainted with St. Vincent DePaul. I think he likes me now. The final school I had the privilege of visiting was the well-known, highly revered University of Chicago. 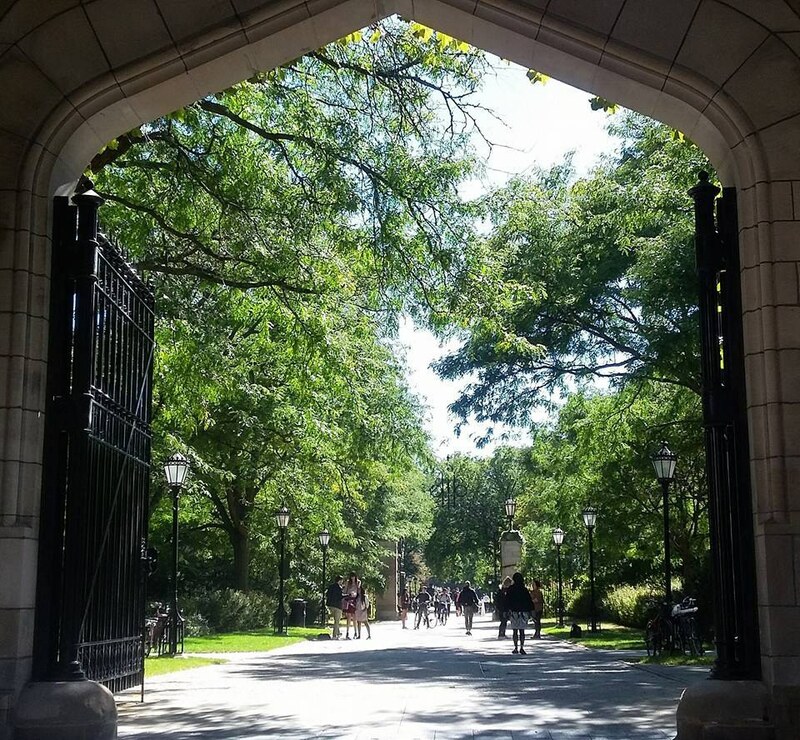 I had heard so many things about this campus - how it was like Hogwarts, how it looked like a castle, how its exterior properly reflected the essence of being a UChicago student. After having walked the well-regarded grounds, I have to say I agree with all of the awe and infatuation surrounding the campus. Its beauty was exhilarating and definitely reminded me of some place straight out of Harry Potter. I didn't feel an overwhelming welcoming feeling or longing for the university like I did with Loyola. It goes to show that just because a campus is outwardly beautiful, it doesn't necessitate that it will be a comfortable environment to be in. It felt like I was walking on hallowed ground or trespassing through a high-end country club. The exclusivity of the campus definitely kept me at an arm's length distance. All-in-all, I'm beyond grateful for having gotten the chance to explore so many different Chicago-based college campuses, even though it's long after the time when I should have taken these trips. You might not have understood all of the dramatization leading up to my story, but hear me out. It's taken me five years to come to the realization that going on a campus tour of the schools you're applying to for college matters so, so much. I don't know if I would have felt so strongly about DePaul when I was 17 had I gone on a campus tour. Maybe I wouldn't have fallen in love with UIC if I knew what glorious, glistening waters awaited me at Loyola. Or maybe I would have become so obsessed with the castle-like appearance of UofC, I would have made that my dream target school. I honestly don't know. In a way, none of it matters now, but these experiences have availed me a newfound understanding of why people take the time out to visit colleges they may never attend. You need to walk around and feel your surroundings. You need to smell the air and see the people and bask in the glow of an academic environment you may never call your own. Don't be afraid of not getting in to the school like I was - we can't win them all. But do take my advice. You need to do all of these things because you might not be as lucky as I've been just by picking schools based on information you've read and seen online. You might end up at a school you detest in an environment you hate. And you can't subject yourself to that torture for four grueling years. Take the time. Visit all of the schools. And if you're past that point in your life, take this thought with you and hold onto it until your own children are ready to plunge into the world of college applications. One visit may truly make all the difference.